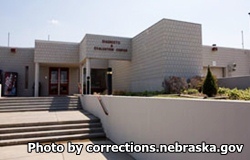 The Diagnostic and Evaluation Center is located in Lincoln Nebraska. It is considered a maximum custody facility because it is responsible for the reception, evaluation, assessment and classification of all adult males in the state. It is at this initial institution that inmates are given an official custody status and placed in a permanent assignment facility. Diagnostic and Evaluation Center is also responsible for performing ninety day evaluation assessments for the court. This facility was officially opened as a 176 bed prison. The Diagnostic and Evaluation Center is a single building that is comprised of nine offender housing units and an infirmary. Additionally, this facility has rooms designated for the various programs offered, a gymnasium and various administrative offices. Visiting hours at Diagnostic and Evaluation Center will depend on the last digit of the inmate's institutional identification number. No visiting occurs on Mondays and Tuesdays. PLEASE NOTE THESE VISITING HOURS CHANGE FREQUENTLY as of March 6, 2019 all visitors should follow the new visiting schedule posted here. Inmates at the Diagnostic and Evaluation Center Hospital have visiting on Wednesdays from 8am-10:50am. Last digits 0/1 have visits on Wednesdays from 1pm-3:50pm. Last digits 2/3 have visitation on Thursdays from 8am-10:50am. Last digits 4/5 have visits Thursdays from 1pm-3:50pm. Last digits 6/7 have visiting on Fridays 8am-10:50am. Last digits 8/9 have visits on Fridays from 1pm-3:50pm.